This is my first post and it's a level. Hopefully it's not too hard. IT's a bit "impossible" at times. How about this one? It's giant maze. 3 star coins. No hidden exit. Idk what it could be used for on community remix. What do you think? Maze levels aren't usually very popular, they're usually frustrating to beat, let alone get all 3 star coins. I kind of pulled up an answer key. The stars are the star coins, the yellow paths branch out towards the coins, and the green path goes to the exit. 1. This is my first (fully) custom level. 2. I am very proud of this, and I am super positive that the level design in this level is better than Hard Super Dario Bros. The video will be uploaded later tonight, but you can download and play it first! Have fun! Beware checkpoints aren't working as usual, so please wait for me to fix it. And somehow I got the secret exit screwed in this version. Updated! This was a very fun level! I did a tas on it, good work man! Enjoyed it a lot. Guys, why can't I import clipboards? I copy paste all your levels but it says "clipboard did not contain valid level"
Make sure you're only copying the level text, even something trivial like a space afterwards will mess the program up. 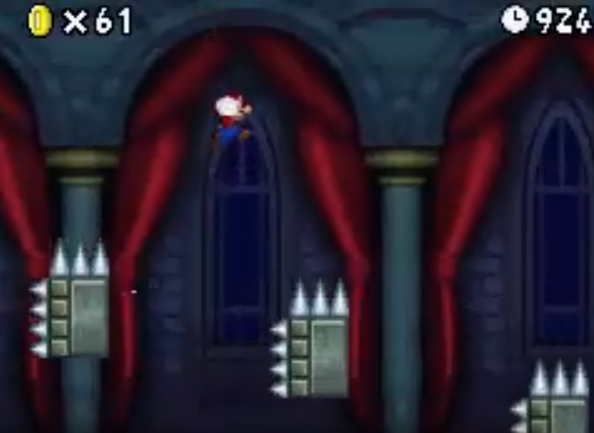 Here I present you all the HARDEST level I have ever come across or ever seen in NSMB or any other hacks. It requires ~50 perfect frame inputs, lots of trial and error and very smart thinking. Think you can beat it? I spent 2 hours trying to on a TAS before I even got that far. Good luck. This hack is for my custom rom, Git gud, which is basically a bunch of impossible challenges together. I think it'd break without the spoiler too. Wow! it's been over one year since my last post. Here's a remake of Super Mario World's first castle. I had some trouble with the second part of the level. Ended up having to make it quite different from the original. I also put some coins here and there just so the level looks less empty. That's really cool! You should do more remake levels! Hey, I made a small little level, it's pretty ugly for now but I will hopefully decorate it later on as time finishes. Here is the download, but even though it's a patch, you only play 1-1. I hope you enjoy it, it may be a little bit hard and look a little ugly, but it is still fun to play. I'm still working on it.